Can this be used as a WISP client router? Re: Can this be used as a WISP client router? Unfortunately the terminology "WISP" means different things to different people. I have always known it to mean "Wireless Internet Service Provider". For some users of this terminology this means connecting their Router to their ISP via a 3G/4G USB Dongle, while other people use this same terminology to refer to connecting to another network via "Wi-Fi", and using that "Wi-Fi" connection, such that all upstream Internet traffic is routed via the Almond's "Wi-Fi" connection. The Almond does not provide a USB port, so can not be used with USB 3G/4G Cellular dongles. It can however be configured to use the "Wi-Fi" interface as the "default gateway". Check out the Beta "Wireless WAN" feature. Simply check to see that this feature is listed in the TouchUI of the Router. 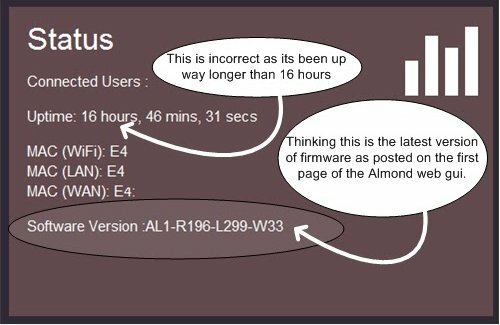 Check your Firmware to ensure you are running Firmware revision: AL1-R196-L299-W33 (or better). I personally have my Almond setup as simple "wired" WAP, so I'm using the "Wireless AP" feature. There are three different modes that potentially could provide the functionality, depending on what you are trying to accomplish. Your original question is very vague about what you are trying to accomplish, so I'm not sure which of these solutions you are looking for. Please tell us more about what you are trying to accomplish, so that we can make the correct recommendation for you.